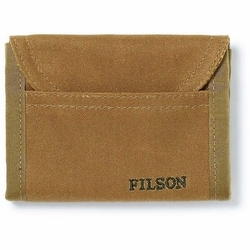 Filson Smokejumper Wallet. Developed at the request of firefighters, our Smokejumper Wallet is made of rugged oil finish Tin Cloth and lightweight nylon webbing. A fold-over flap self-closes into an exterior pocket for simple, convenient carry.